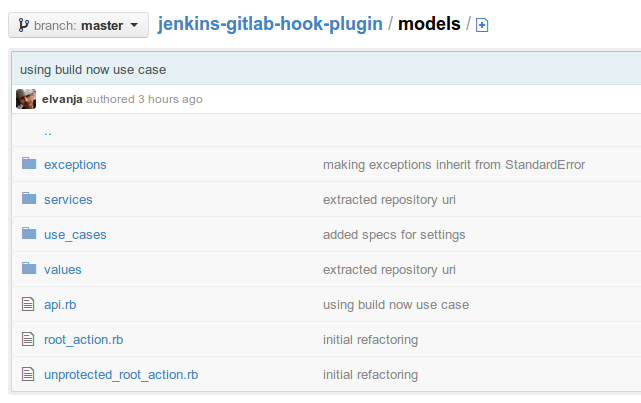 The Jenkins Gitlab Hook Plugin received a major refactoring. The goal was to separate concerns from existing modules and to make the project testable. Github repo now contains Java binaries needed to run the rspec tests, but hopefully you’ll find the new organisation a bit more intent revealing and easier to follow. The remaining models in the root models folder are all directly Jenkins related and left there so Jenkins can load them first and register the plugin and the related web hook correctly. The entire domain knowledge is now also testable. I chose the rspec to run the tests and have created the related spec helped that loads all the Java dependencies and models from the root folder. To run the specs, you’ll need to setup JRuby so it runs in Ruby 1.9 compatibility mode. Just add the following switches to your JRUBY_OPTS environment variable: –1.9 -Xcext.enabled=true -X+0. The v1.0.0 release has all the goodies, so feel free to upgrade your Jenkins environments. There have been a few changes to the Jenkins and the related Ruby runtime as of late. This has caused a few issues with the Gitlab Jenkins Hook plugin which have finally been resolved. It is recommended that you upgrade to the latest plugin version v0.12.2 and Jenkins to the latest available version if possible. 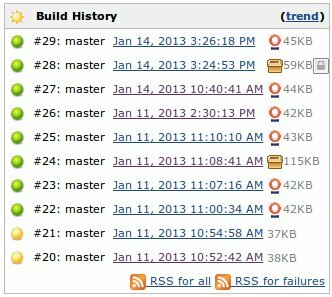 Otherwise, I would stay away from Jenkins v1.519 to v1.521 and the plugin version v0.2.7 to v0.2.11. If you are not experiencing any issues currently, that’s OK, this is related only to those that want some part of the system upgraded for whatever reason. This will enable the release plugin to work even with non master branches. Some of these are imposed by our own work flow which may not fit yours, but it seems to me that the final solution is good and applicable to other ecosystems as well. So essentially, “npm install” is executed. At this time, using npm is OK since developer machines or CI build machines have internet access and can pull all those dependencies easily. One more trick was needed in this Ant task to make tests visible to Jenkins. The output folder for the test results is “target/failsafe-reports”. If you don’t put them here, Jenkins will not pick up the test results. I’ve described only the main / deployable project configuration, but common dependency projects can be configured in the same manner. All you need to take care is the versioning of the artifacts since NodeJS standard versioning has nothing to do with the way Maven takes care of that. I guess one could also tweak NodeJS project version to be read from pom.xml, so everything stays dry. But, that is a tale for some other time. Jenkins CI is well known open source continuous integration server, and a damn good one in my opinion. I guess the biggest issue is to get to know all the plugins available, a fun time indeed 🙂 Anyways, since the switch to Git/Gitlab, I needed a setup that would enable the team to use the CI environment in full. The idea was to allow CI environment to build all the branches, not just master (release, develop, whichever is your flavor of the day) branches. Manually setting up Jenkins projects for all the Git branches was out of question. A little background first. The projects are mainly Java / Maven and there are a lot of dependencies. One rule that is most important for Jenkins environment was that the developers need to keep their tasks / features in separate Git branches. This would prevent clashes between developers, but still allow them to work through the entire stack if needed. Jenkins was to be used as continuous feature testing environment so all those branches had to find their place in the CI stack too. This build is parameterized checked, with a single parameter “BRANCH_NAME_TO_BUILD”, and the default value “master” (or “develop” or what ever you use). Git repositories and branches set to track the Git repository, and to build branch from the above parameters setup. All using Git plugin. Build name set to branch name, courtesy of Build name setter plugin. A specific thing about the setup, that might not work for you, is the Artifactory / Maven part. The policy is that only release artifacts are allowed in Artifactory. This reduces the noise and keeps the Artifactory slick (it is getting rather big anyway). The problem is with building dependencies for feature branches that are always snapshots. For this to work, and to be able to use different nodes, you still need something like Artifactory. If building on a single node, you can just put “install” as a Maven goal and you’d get the dependency on that computer. For multiple nodes, one idea was to tell all the nodes about each others maven repositories, but that seamed like too much maintenance. So, the workaround was to create a webdav Apache folder that Jenkins could use to put all builds into. And, that same repository was referenced in Maven settings on each of the nodes, and on all of the developers machines too. This enabled Jenkins to “know” about all the feature branches artifacts, while not putting too much strain on Artifactory. And, that Maven repository can be cleaned periodically without peril. This setup is pretty much it. With it you get to build a specified branch at any time. The feature branches build nicely throughout the entire stack and you have a single project on Jenkins that prevents concurrent builds of the same code base (so resource issue is no longer valid).